I used to think that the God of the Old Testament was somehow different from the God of the New Testament. I had heard somewhere, when I was a kid, that Jesus was nicer than His fire and brimstone Father. I heard that Jesus was more compassionate and more merciful. I didn’t know about God’s Compassion and Mercy in those days. It didn’t occur to me that Jesus, being One with the Father, would be the same as He is (John 10:30). These days, I hear familiar whispers that separate Jesus from the Father and “Old Testament” thinking from “New Testament” ways. 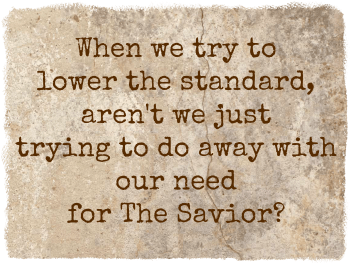 People often talk about Jesus as though He has lowered the standards set by Yahweh. I have heard this quote a lot lately to support a lowered standard: And as they continued to ask Him, He stood up and said to them, ‘Let him who is without sin among you be the first to throw a stone at her.’ (John 8:7). But this Word from Jesus doesn’t lower God’s standard, because a lower standard wouldn’t require His mercy. To the woman caught in adultery, and to all of us, Jesus shows Grace (unmerited favor) and then says to repent and to “go, and from now on sin no more” (John 8:11). When we encounter the Grace of Jesus Christ, we cannot remain as we once were…we are called to walk in newness of life (Romans 6:4). In fact, His Spirit alive in us, enables us to grow in righteousness and learn obedience. The deposit of the Holy Spirit, in us, is a gift from God the Father, wrought by the work of His Son. Centuries before Jesus came, the LORD promised all of this: And I will give you a new heart, and a new spirit I will put within you. And I will remove the heart of stone from your flesh and give you a heart of flesh. And I will put my Spirit within you, and cause you to walk in my statutes and be careful to obey my rules (Ezekiel 36:26-27). Did Jesus change everything by coming to live among us and dying so that we might live with Him? Yes. And no. Yes, Jesus is Emmanuel God with us, which is simply miraculous. But no, God’s plan has always been to create relationship with His people. He remembers that we are dust (Psalm 103:11-14). Jesus said this: You shall love the Lord your God with all your heart and with all your soul and with all your mind. This is the great and first commandment (Matthew 22:37-38). Jesus, being an observant Jew, was quoting the Shema: You shall love the LORD your God with all your heart and with all your soul and with all your might (Deuteronomy 6:5). Jesus said this: And a second [commandment] is like it: You shall love your neighbor as yourself. On these two commandments depend all the Law and the Prophets. (Matthew 22:39-40). Here Jesus is quoting an Old Testament teaching, which was very well known at the time: You shall not take vengeance or bear a grudge against the sons of your own people, but you shall love your neighbor as yourself: I am the LORD (Leviticus 19:18). God is not man, that He should lie, or a son of man, that He should change his mind Has He said, and will He not do it? Or has He spoken, and will He not fulfill it? (Numbers 23:19). Of Himself, He has said, “For I the LORD do not change.” (Malachi 3:6). He is The Great I AM. And the Son is like the Father: Jesus Christ is the same yesterday and today and forever (Hebrews 13:8). I really find comfort in the sameness of The Father, Son and Holy Spirit. In a world full of disappointment, God comes through for us. He is dependable and reliable. He is steady. He demonstrates Integrity: (1) doing the right things for the right reasons (2) Wholeness (3) Stability. This is why we are called to imitate Him. He is perfect. Thank you!! I think this post has 39 revisions – the dashboard keeps track. I am not exaggerating. It is good to hear that they worked to make my thoughts coherent. It sure took a while! Lovely to hear from you, dear friend!